Always such elegant presentations of your flowers Susie. 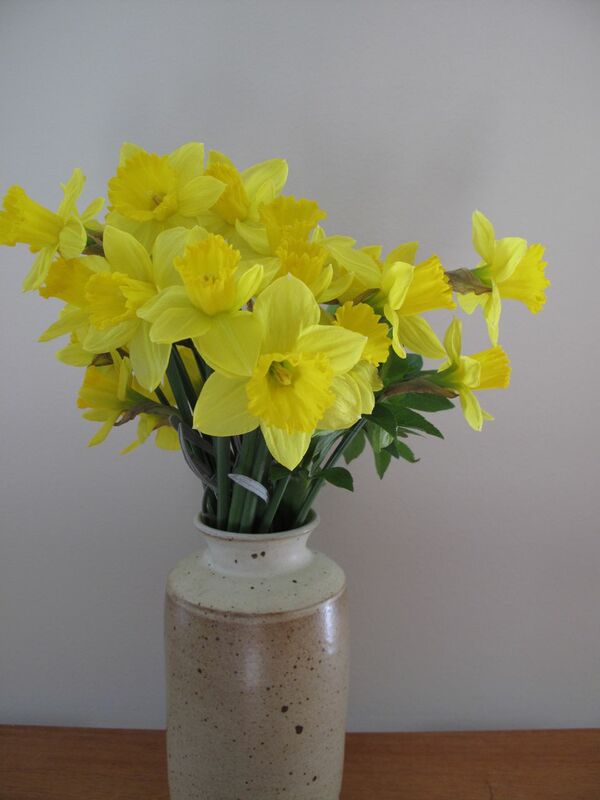 I love the Daffodils in thir vase and am envious that you have so many. And I have my eye on your richly colored anemone coronara! I don’t think I’ve anticipated the daffodils so strongly before–this winter has felt long and tedious and it’s nice to share some signs of spring. Thanks Christina. Glad you enjoyed a smile from the daffodils Cathy. Isn’t it exciting to see these first ones leading us into spring! This one is a favorite! 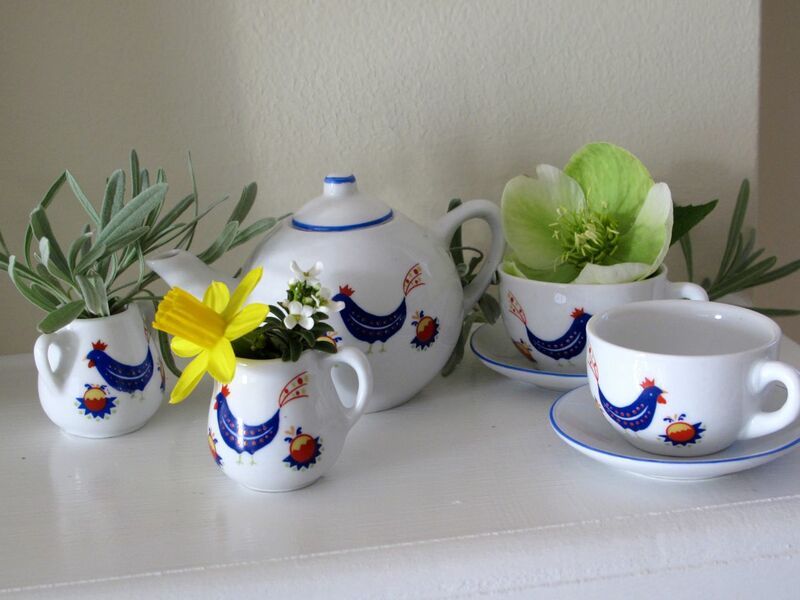 The tiny tea set provides the perfect vessels to mix new memories with old. You have a flare for creating the most engaging vignettes! Or flair! I must have my mind on Cathy’s red “fire” posy! Thanks Marian! My daughter is not sentimental about things like this tea set but just a glimpse of it takes me back to some sweet memories. I enjoyed using it yesterday. 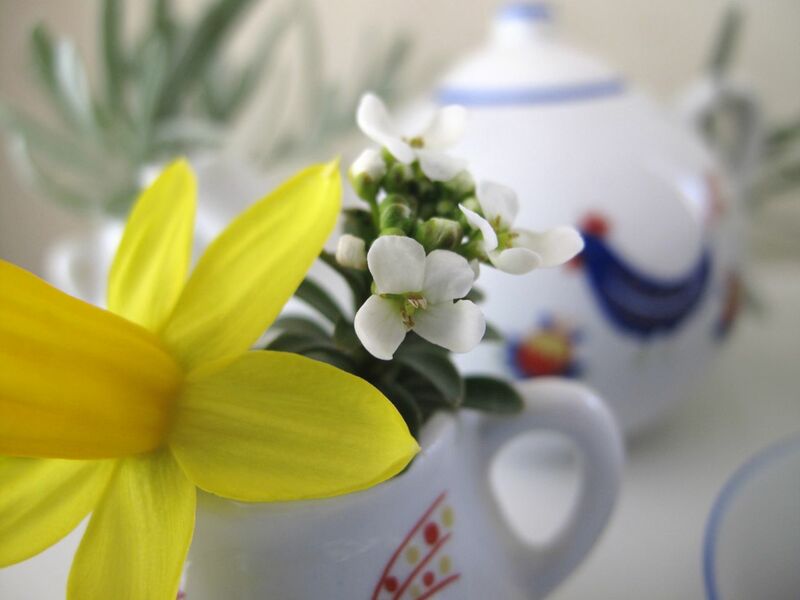 There’s nothing like a bunch of daffodils to bring sunshine into the house on a spring day. You can’t help being cheered by them. I love your miniature arrangement. Even though I have plenty of spring flowers out I can’t bear to pick them. This is a great way of displaying just 2 or 3 choice flowers. Choris, I understand not wanting to pick your spring flowers. They make such a difference in the landscape this time of year. Think I’ll rely on this miniature grouping again. Thank you Annette. The colder weather is returning later in the week but for now I’m basking in the sunshine, getting a few garden details done. Hope your week is nice too! Thanks Cathy! I thought using that tea set at other times but it wasn’t appropriate at the time. Glad a use for it came along. You’re wise to scout around for potential vases. I’m finding this Monday exercise is making me look at not just flowers differently, but gives me a chance to use the many items I had trouble giving away when wanting to declutter. What a lovely way to display your flowers this week – I think we are all trying not to disturb our precious outside display’s too much at the moment. Like Cathy I am looking at my possessions with a new eye – I think I will have to dig out the dolls tea sets – I can feel an Easter arrangement coming on with eggs and chocolate bunnies! Thanks Julie! The first spring blooms are precious. I’m looking forward to your Easter eggs and bunnies! It is interesting to find a new use for things isn’t it. Now I’m sorry I didn’t plant more bulbs around Thanksgiving. Enjoy the fruits of your labor either in a vase or in the garden. Either way, these are a beautiful sight. Thank you! By Thanksgiving I’m never in the mood for planting but like you, I always wish I had. The good thing about daffodils is they are so reliable year after year. I love that hellebore! Does it stand out in the garden or does the green kind of get lost? It looks great in a cup like that, very stylish (not that I’m one to comment on style!). Cutting the daffodils was a good idea. Someday I hope to get a few blooms to bring inside 😉 and when I do I’m doing all yellow trumpets too! 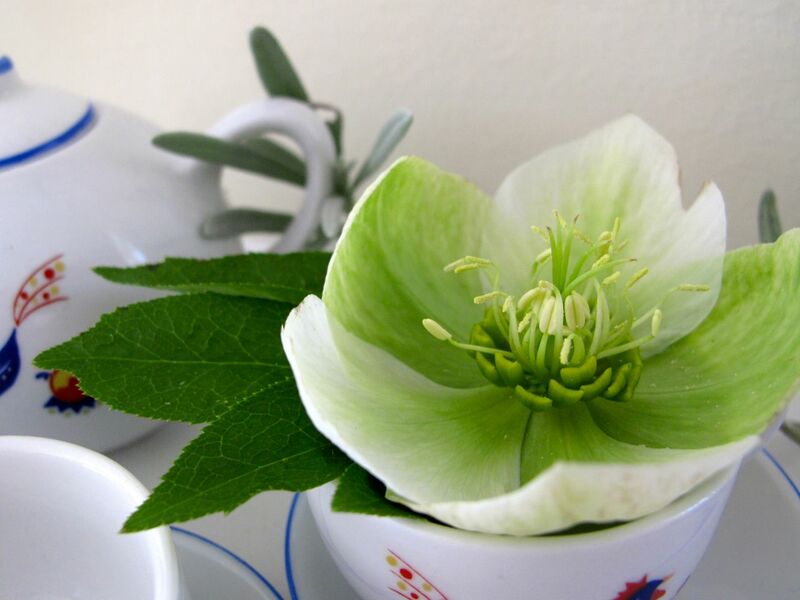 I normally think of that hellebore as white, but it seems to photograph greener. The daffodils have been so nice indoors. 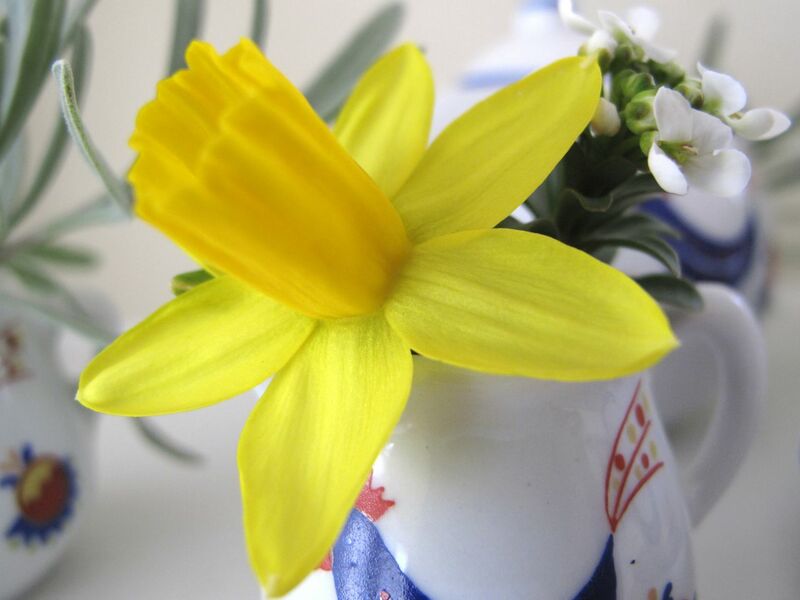 Below freezing tonight so hope the rest of the daffodils will be ok.
i love the ‘tete-a-tete’ narcissus. I planted some last fall, I’m eager to see them in bloom. I hope you get to glimpse your tete-a-tetes very soon! These are in their second year. I planted them without really knowing how they looked and have been so delighted with them. 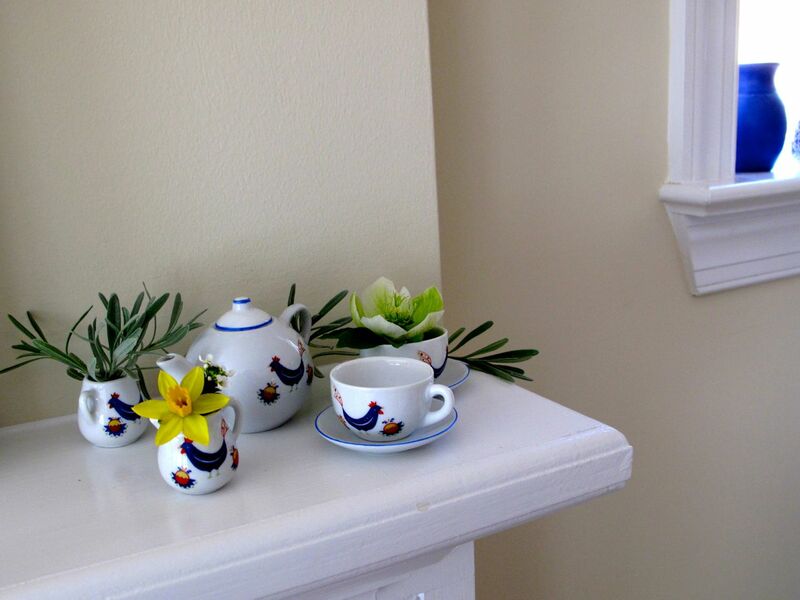 You are accomplished at capturing the essence of a group of things, like the tea set and flowers. And the cut glass prism-rainbows with flower arrangement. These compositions make a universal statement. A picture evoking a chain of thought and memory. Like haiku. Thank you. 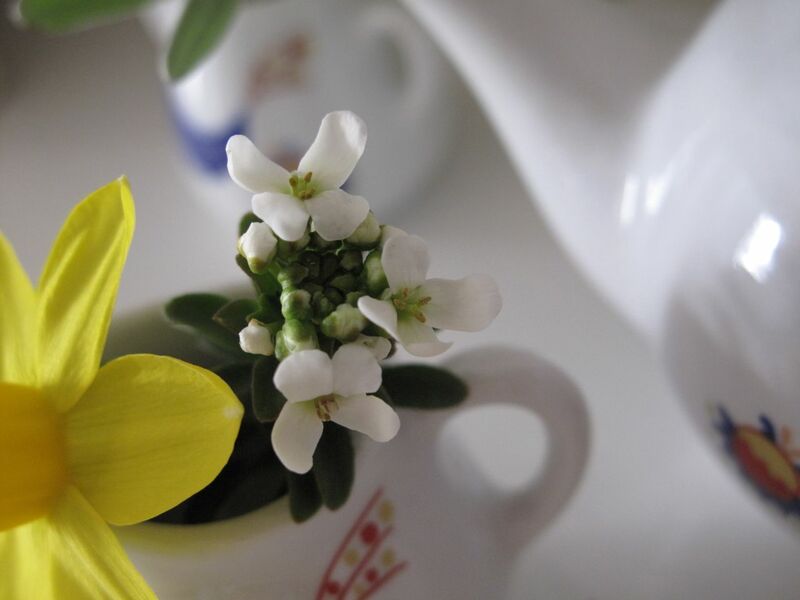 Thank you–I’m enjoying the vase on Monday challenge as much for the photographs as the flower arranging. Actually, am finding the images more difficult. Objects come and go. I match my image for our Garden with my work. Especially work in recognition of our healing images is a kind of devotion to us. Surprisingly, education ignores the teaching of this, unless one is profoundly disabled. In the Healing Garden we have only daily work and practice to truly call our own. Images become for others a road map and a memory palace for ourselves. This is a lot to ask of our images, too.